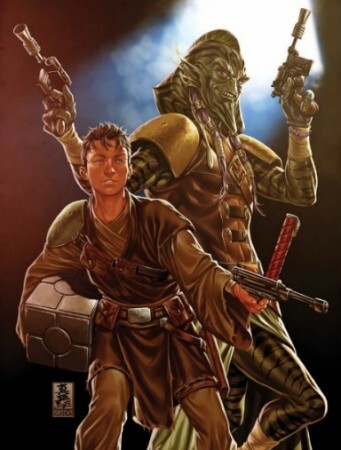 Caleb Dume’s life following the fall of the Jedi Order, told by Greg Weisman in the comic The Last Padawan and John Jackson Miller in his novel A New Dawn, is without purpose or direction. Taking the parting words of his master Depa Billaba to heart, he runs deep into the galaxy’s underworld, falling in with the scoundrel Janus Kasmir, assuming the name Kanan Jarrus, and doing his best to avoid Imperial detection. When A New Dawn catches up with him in his mid-twenties, he is a cog in the Imperial machine, a miner on the moon of Gorse, drinking heavily and getting into barfights. Initially apathetic to the horrors committed by the Empire and dismissive of his friend Skelly’s “conspiracies,” the novel follows the re-awakening of Kanan’s sense of social responsibility, as the mysterious Hera Syndulla’s investigations uncover the evil at the heart of Count Vidian’s designs. We never see the moment Kanan recommits to the path of the Jedi, but it seems to go hand-in-hand with his commitment to Hera’s cause. In the first Rebels story, “Spark of Rebellion”, Kanan steps out of the shadows and reveals himself to the Empire. His ambitions are humble – it does not occur to him that he could bring down the Empire, and he is later resistant to Ezra’s belief that they can destroy the Sith – but he does what he can to help the people of Lothal. When it becomes clear that Hera’s cell has been identified as an ally by the larger Rebel Alliance, he is reluctant to join a full-scale military conflict, and is downright hostile to the former clone trooper Rex. These are the first signs that Kanan represents a new era of post-Clone Wars Jedi: he shares Yoda’s understanding that the Jedi were wrong to leap into the Clone Wars on the side of the Republic so quickly, in the delusion that they could save the galaxy by fighting. Kanan’s commitment to resuming the mantle of “Jedi” raises an interesting question: what is it that separates him from Ahsoka Tano, the other young former-Padawan to have escaped the Emperor’s purge? Though she no longer identifies as a Jedi, there is little evidence that her nature or outlook are so different from his, and she never wavers from the light side. She also, though, never changes her decision to leave the Jedi Order following its betrayal of her. Had she changed her mind, could she have called herself “Jedi” once again merely through making that choice? In a post-Order 66 world, what does it actually mean to be a Jedi? Is it just a case of committing to their ideology, and to the social responsibility that comes with it? Kanan’s life differs from that of a traditional Jedi in some crucial areas, but he maintains their philosophy in all the ways that really matter. Kanan has a family. More than that, he has a love interest. This is a radical departure from the strict monastic lifestyle of prequel-era Jedi, an order which maintained galactic peace for a thousand years, but which was arguably ill-equipped to deal with the unique circumstances surrounding Anakin Skywalker. Yoda clearly saw the need for this aspect to be swept away, sending baby Luke and baby Leia to be raised by loving families rather than training them from birth, and Kanan’s “family” brings him strength, enriches his life and gives him purpose. And as Luke ultimately will, he finds a balance, loving them selflessly and avoiding the pitfalls of attachment. Kanan’s “knighting”, delivered via a Force vision in the Jedi Temple on Lothal in “Shroud of Darkness”, comes at a crucial moment. Taunted by a familiar-sounding temple guard, Kanan fears he is losing Ezra to the dark side, and lacks the power to protect him. Angrily, he fights back, using both a blue and a red lightsaber in a symbol of the temptation of the dark side. In his wisdom, though, he switches off his weapons, accepting that he cannot protect Ezra from everything, and at this moment he passes his trial and “officially” becomes a Jedi. Letting go, accepting that you cannot control and protect everything and everyone, is a central Jedi lesson, and perhaps the central philosophy of Star Wars. It is the thematic through-line that connects the journeys of Anakin (who seeks power to save and control) and Luke (who almost kills Vader from a desire to protect Leia, but throws away his own weapon). In switching off his lightsaber and refusing to fight, Kanan sets a precedent that will define the Jedi going forward, and Yoda’s role in this Force vision indicates that he, too, understands this. This wisdom extends to Kanan’s relationship with Hera. In “Rebel Assault”, his reckless, solitary attempt to rescue Hera from the Empire is cut short when he meets a Loth-wolf, an encounter he recognizes as a message from the Force. He surrenders to the Force’s will and abandons his quest, reuniting with his friends and showing patience. In “Jedi Night”, he asks Ezra to lead the mission to save Hera, aware that his feelings for her could cloud his judgement and lead to mistakes. In these choices, he shows us that his love for Hera is mature and healthy, entirely unlike Anakin’s possessive and jealous attachment to Padmé. It can be possible for a Jedi to love romantically, as long as that love comes from a place of compassion above all. 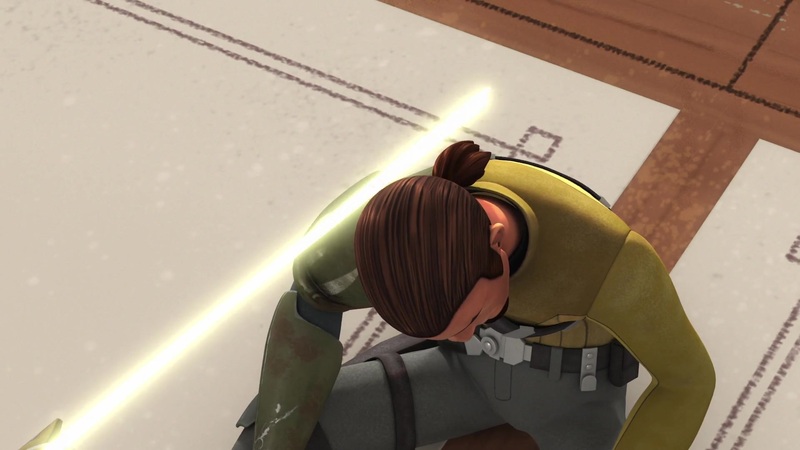 Even before his knighting, Kanan makes the commitment not just to be a Jedi, but to be a teacher. His decision to train Ezra, despite his own wayward path, is not one he makes lightly, and he is well aware of his own flaws. “I may fail”, he tells Ezra in “Rise of the Older Masters”. “You may fail. But there is no try.” Through training Ezra, he gains new understanding of Yoda’s lessons (having previously admitted that he never understood the “do or do not, there is no try” mantra), and his acknowledgement of his own failings as a part of the training process is an enlightenment that Luke Skywalker will take far longer to learn. 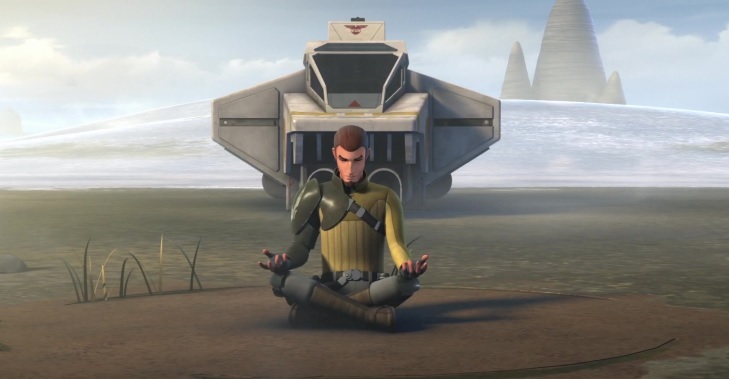 Rebels is as much Kanan’s journey as a teacher as it is Ezra’s as a student. The challenge and burden of teaching is central to a Jedi’s life, and not just for a Master – in The Clone Wars, Ahsoka is tasked with teaching both the corruption-fighting children on Mandalore and the Jedi Younglings on Ilum, despite only being a Padawan herself. And Kanan’s role as a teacher is not limited to Ezra. He also helps Sabine discover her destiny on Mandalore, and in the process learns that every student requires a different approach, and not to fear that individuality. Kanan’s ultimate legacy as a teacher with Ezra and Sabine will be seen in the next few weeks, but few Jedi Masters could have raised better people to stand in defense of Lothal. Even after his knighthood, Kanan continues to learn. Following his blinding by Maul in “Twilight of the Apprentice”, he cuts himself off not just from his family, but from the Force itself. It takes the guidance of the mysterious, Tolkienian Bendu to find his way by finding himself again. Kanan’s difficulties here reflect those of Luke in The Last Jedi: when Kanan senses the fear in the Atollon spiders, he instinctively ignites his lightsaber, before realizing the fear is actually his own. Through Bendu’s guidance, he finds balance within himself, with the environment, and with his Padawan, as he realizes that seeing himself and trusting in the Force means he is never truly blind. Learning is a lifelong process. Kanan is also wise enough to know when not to follow Bendu’s path. Bendu’s idea of “balance” is to withdraw from the galaxy and let it all happen naturally – that the light and the dark will sort themselves out, a rationalization that Luke will delude himself with during his exile on Ahch-To. Kanan, though, isn’t buying it. As he tells Bendu, he too once withdrew from the galaxy, and he realized that if you stand by as evil spreads, you are complicit in it. 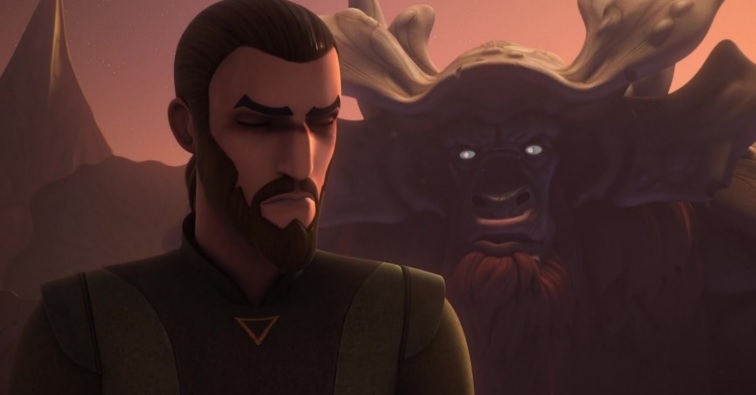 Some things, he tells Bendu, are worth fighting for, and in this moment he speaks for the ethos of Star Wars itself as he rejects Bendu’s apathy. This statement effectively seals Kanan’s fate. The Jedi are defined by their selflessness, and Luke’s death in TLJ and Kanan’s in “Jedi Night” explore what that actually means. One Jedi cannot save the galaxy and hold back the darkness alone, but by being an example of compassion and sacrifice, they can protect the spark of hope and inspire others to greatness. Kanan’s ending is that of a true Jedi, and its impact will define the rest of the final season of Rebels. Kanan was no “Chosen One”. He did not arise from a great lineage, and the Force did not explicitly choose him for some galaxy-shaking destiny. He just did the best he could, but in doing so became a beacon of what it means to be a Jedi after the fall of the Republic. A defender of the innocent who only turned to violence when he had to, capable of loving deeply and of letting go when necessary, a teacher and mentor who continued learning until the very end. The role of the Jedi after the prequels is not a galactic police force or military, enforcing peace at the blade of a lightsaber – it is a few people living selflessly and inspiring others to greatness, and Kanan is its first practitioner. At the end of TLJ, Rey finds herself in a remarkably similar position to Kanan when we meet him in Rebels: the Jedi figurehead of a small band of rebels on an old freighter, among them a hotshot pilot and an Imperial runaway, trying to find her path without the guidance of an established Order or even a master. The sacred Jedi texts she stole from the Ahch-To temple will not mention Kanan Jarrus, but should she learn anything of his journey, Rey could do far worse than follow his example.